Many games attempt to emulate the difficulty and formula of the classic games from the 1990s, such as Metroid, Castlevania, and Ninja Gaiden, but rarely does one pull it off with not only the reminiscent look we remember so well, but also more importantly, the quality that came along with the games of those times. And while most fail to do so, every once in a while, one manages to break through and recapture that same love for classic games. This is absolutely one of those times. 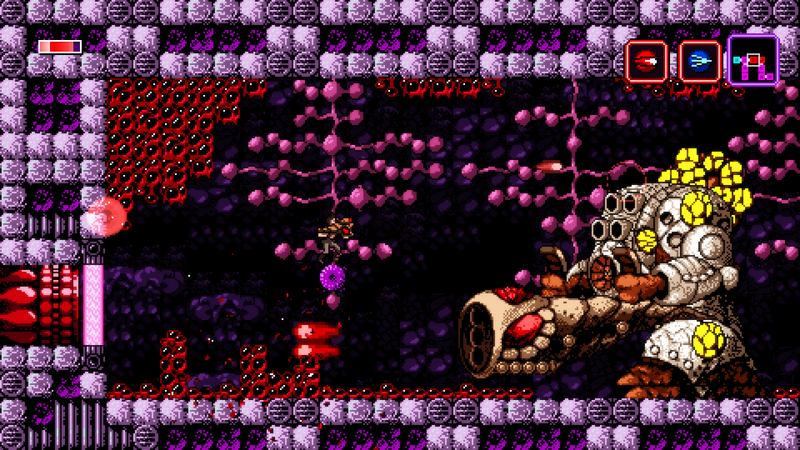 Axiom Verge is a 2D platforming “Metroid-vania” game created in the 16-bit style of the NES and SNES by the extremely small Tom Happ Studios. The story follows a scientist, Trace, who awakens in a strange and futuristic world injured after an accident at his lab, who now has to find out what happened to the sentient giant beings you come across in order to find you way home. Similar to other games in the Metroid-vania style, you traverse a large map looking for weapons and abilities that allow you to progress through areas you previously weren’t able, and there are a lot of areas right away that block your character off. But each time you pick up a certain lab coat or weapon upgrade, an entire new sector of the map opens up to you, each fresh and full of more challenges and upgrades along your journey. Each of these upgrades feels integral to moving the plot forward. While theoretically you could make it through the game with only 40% of the upgrades, you find very quickly that the more weapons and health nodes you pick up, the more likely you are to survive the intense difficulty curve the game throws at you almost immediately. I mentioned above how this game emulates the difficulty of the early generation of games, and there is no understating that. With two difficulties, normal and hard, the game gives you a few rooms to acclimate yourself to the controls before throwing you in to combat with nothing but a single blaster. As you master the best techniques for taking on each enemy, the game will add new enemies to throw your way and start the process all over again, while making it intensely gratifying when you conquer an area without dying. That being said, the game gives you plenty of save stations along the way, many of them across from the red doorways that mark boss rooms. This is where the game becomes truly epic. As you walk through the doorway towards each boss, the room will expand around three times as big as was to reveal an enormous grotesque monster-like creature, giving you a brief few seconds to potentially analyze weak points and make a strategy before tossing you in with no tips. And the feeling you get when you clear each boss after leaping around and pulling off as many shots as you can before you’re dealt massive damage is paramount to almost any experience the game can give you. Perhaps the weakest part, but not horribly, of the game is the story, which overall gives you the impression that everything happening around you is entirely out of your control and you’re only a small part to play in this universe you find yourself in, before a twist near the end makes you second guess that and think differently. Without going into anything that would spoil the game for you, Axiom Verge takes an interesting, if not fairly science-fiction based, stance on the morality of delving too far into discovery and the age old question of “just because we can, does that mean we should”. The best part of the game, in my opinion, is the incredible synthesized soundtrack that encapsulates you in this cybernetic world. Each area of the game has its own unique soundtrack, and each background song played is accompanied by heavy bass kicks and electronic melodies that tend to stick with you even after you put the controller down, which is just a great addition to an already amazing game. Overall, Axiom verge is a masterpiece that truly deserves to stand next to the games like Metroid that invented the genre. There’s a lot to do in the game, but you never feel forced to participate. It mixes the feeling of being allowed to freely explore with a linear world that pushes you to progress as well as backtrack for rewards. And the fact that this whole thing was made by one man, Thomas Happ, is truly astonishing. 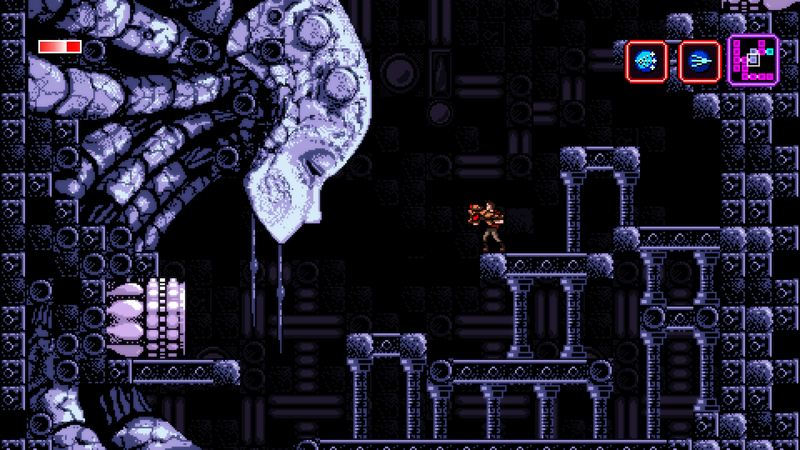 Do yourself a favor: pick up Axiom Verge and spend the 15 or more hours in a world that lives up to our classic game expectations.